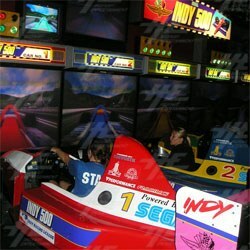 Indy 500 - Attraction Version is an enhanced version of popular driving game Indy 500. It features a 6 player linked system with large screens in front of complete cockpits. The vehicle cockpit is fully equipped and includes authentic race suspension. Jurassic Park: The Lost World Special is a mid-size attraction version of Sega's popular light gun game. The Special edition features a large moving platform which the players stand on whilst playing, and also has different gameplay compared to the other versions. For more information please click on the above links, or contact one of our sales staff.